COLORADO SPRINGS, Colo. (Aug. 27, 2015) – The Silver State of Nevada will host the silver anniversary of the prestigious U.S. Open as USA Taekwondo has announced Reno as the site of the 2016 event as well as the site of the 2016 U.S. Olympic Team Trials for Taekwondo. The international U.S. Open will be held Feb. 3-7, with the U.S. Olympic Team Trials kicking things off on Feb. 2. Both events will be held at the Reno-Sparks Convention Center. The 2015 U.S. Open in Orlando was awarded a G-2 rating by the World Taekwondo Federation and the event hopes to achieve a similar rating for 2016. Registration will be opening soon, so keep an eye on this website for more details of how to book your place in the competition. Full details on the 2016 Olympic selection procedures can be found at HERE. To help you get to the event we recommend booking discount flights through our partnership with United Airlines – within the next few weeks we will be emailing a code to all USA Taekwondo members that will give the best prices for flights to those attending this event, and other USA Taekwondo events throughout 2016, so look for that arriving in your inbox soon. Once you arrive in Reno you’ll need somewhere to stay – again we’ve got you covered. Reservations can be made at THIS LINK in the coming weeks to take advantage of discount accommodation and help support USA Taekwondo. More money saving deals will be announced as we get closer to the event. 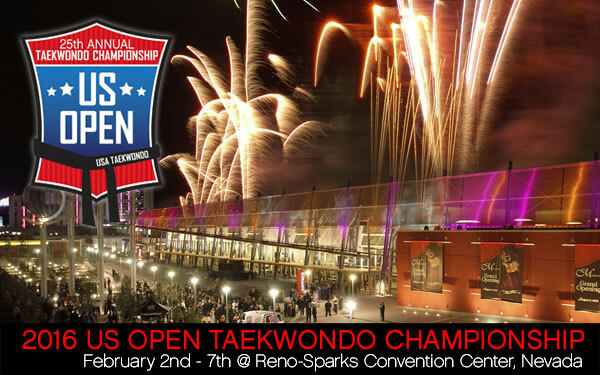 USA Taekwondo is fully committed to making the 2016 U.S. Open Taekwondo Championships the best yet, and look forward to bringing you much more information on the event over the coming weeks and months.